Griffen Logue (right). Photo: AFL Photos. 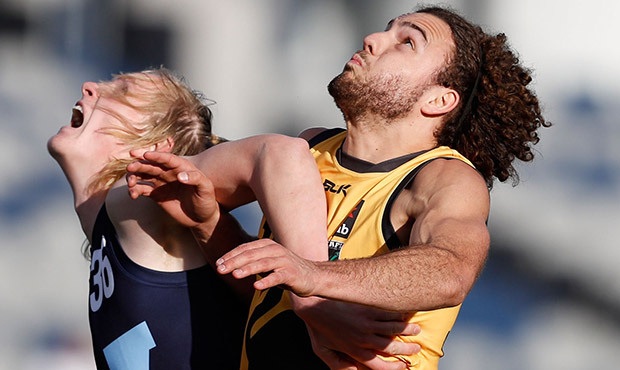 SWAN Districts coach Greg Harding says this week’s AFL Draft Combine in Melbourne is an opportunity for Griffin Logue to make a good impression ahead of November’s Draft. The 18-year-old defender made his WAFL league debut this season and played eight games on top of one game in the reserves and seven colts games. Logue is among a pool of 80 players featuring in the draft combine held at Docklands. The event featured a series of tests such as the standing vertical jump, 20m sprint, agility test and goal kicking test. Harding said the club was very excited about Logue possibly entering the AFL system. “Probably from halfway through last year when he was going through the colts system, it was evident that he was on his way to AFL footy,” he said. Harding said Logue was the most powerful young player to come through the club’s system. “Whilst he has played defence this year, he also played midfield roles and forward as well but his number one weapon is his athletic ability in a couple of areas as well,” he said. In terms of the Guilford Grammar School graduate’s personality, Harding said he was a “very measured” kid. “He is a lot more mature than the average 18-year-old, he is extremely driven. His ability to self-manage and control his preparation is outstanding,” he said. “He comes from a real successful background, his uncle is Andrew Vlahov who used to be the captain of the Perth Wildcats, so he comes from a really driven family. Harding said the draft combine was irrelevant for a talented player like Logue. “For another young kid, who maybe is not a certainty coming through, if he came out and ran out a fantastic beep test and clubs did not know that they had strong endurance, maybe it has some effect for some players,” he said. “But for Griffin Logue, who has played outstanding footy at league level in our competition in a side that has only won two games, the draft testing is just another opportunity for AFL clubs to touch base with.